Bypass Fat 99 - High Energy Dairy Supplement - ORIGO - Supplier of High-quality animal fats and vegetalbe oils. ORIGO – Supplier of High-quality animal fats and vegetalbe oils. Bypass Fat 99 is a high-energy rumen bypass fat. This product is hydrolyzed and has a total fat content of 99%. Due to a higher free fatty acids and stearic content, Bypass Fat 99 is the perfect choice to overcome energy deficiency. 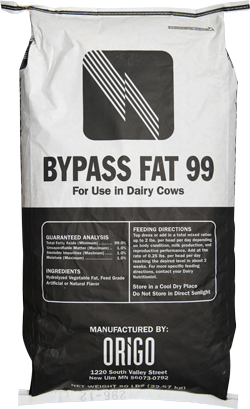 Bypass Fat 99 maintains a minimum free fatty acid content of 80% for high digestibility. Bypass Fat 99 has a higher total fat content of 99% compared to calcium salt products which tend to be in the 85% range. Bypass Fat 99 can be either top dressed or mixed in a TMR. Bypass Fat 99 will not lower dry matter intake. Bypass Fat 99 has a fatty acid profile with over 85% saturation. Recent studies have shown that highly saturated fats have a positive effect on milk components. Bypass Fat 99 is sold in high quality 50 lb. bags or 2,000 lb. totes.